The story of the heavyweight division hasn’t been all that riveting over the past decade, but the tale of the two men that have rendered it virtually irrelevant is something else entirely. Vitali Klitschko and his brother, Wladimir, have long since put to rest any potential challengers in boxing’s most popular weight class. It’s been more than nine years since Vitali has had anything resembling a competitive fight and nothing is expected to change on Saturday, when he defends his WBC heavyweight title against unbeaten Manuel Charr in Moscow. Saturday, though, will still be a big day for Vitali and Wladimir, the WBA-WBO/IBF champion. 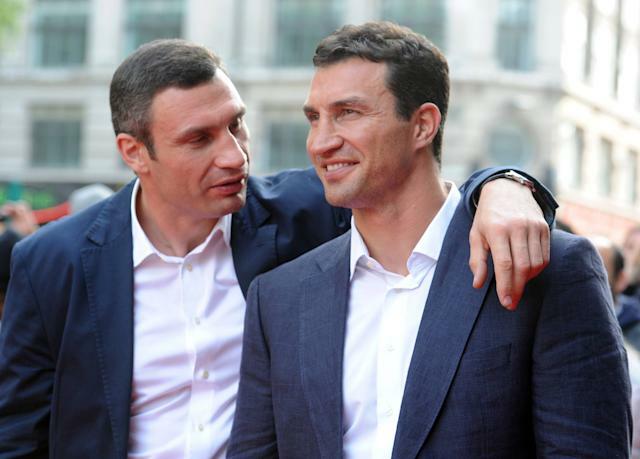 HBO will broadcast the two-hour documentary film "Klitschko," a fascinating but often slow-moving look at the brothers' lives and ascension to boxing superstardom. It includes an almost too-good-to-be-true scene in which promoter Don King is trying to sign them to a contract after Wladimir won a gold medal at the 1996 Olympics in Atlanta. Not long after the gold-medal match ended, a man who had been sitting in the stands next to Vitali handed him a cellular phone and told him King wanted to speak to him. "I was very surprised to be suddenly talking to Don King," Vitali said. "Don King! The man who promoted Muhammad Ali and Mike Tyson, talking to me. I was in shock." The documentary includes footage of King in his Florida home attempting to regale the brothers to induce them to sign. Vitali, the older brother by five years, warned Wladimir not to sign anything at that point. And so King stepped up the pressure by going to a piano and beginning to play Mozart's "Don Giovanni Overture." "He said, 'Especially for you, I'll play this special song,' " Vitali said. "He sat down and started playing like a professional. We were impressed and thought, 'What a multi-talented person. He's not just a boxing promoter. He's an artist, too.' Yes, he was really an artist." Vitali, though, naturally was suspicious. He casually sauntered over near the piano, where King was swaying with verve. And then he saw something that killed a potential deal. "I walked around the side and saw that it was all a fake," Vitali said. "The piano was playing itself. I could see one of the pedals moving without him touching it." The film is thorough in exploring the brothers' young lives, including their father's involvement in the cleanup after the nuclear power-plant explosion in Chernobyl. While sometimes very specific and slow, those who are fans of the brothers or those who simply want to know more about what has made them the most dominant fighters in the heavyweight division will see "Klitschko" as a slam-dunk hit. One of the more interesting scenes shows Wladimir Zolotarew, the boxing coach at the Army Sports Club in Kiev, Ukraine, and the man who taught them to box, describing the differences between them as boxers. Wladimir has always been regarded as the more athletic and fluid of the two, and Zolotarew gave a succinct breakdown of the brothers. "How can you compare Vitali and Wladimir?" Zolotarew asks rhetorically. "Vitali is made of stone and Wladimir is made of clay. When I taught Vitali something new, it would take a while for him to perfect the move. Carving stone takes time. Wladimir was easier to mold, but he would weather more quickly. They are two distinct fighters and needed different approaches." The brothers shared a common theme in seeking to educate themselves, and both eventually earned doctorates in sports science. It is that passion for education and knowledge that led Vitali to resist attempts by Soviet sports authorities to end his education and change the man he would ultimately become. "Because I was a strong boy, I often used to hear things like, 'Hey, you've got what it takes. You don't need to go to school. We can use you,' " he said. "Those are the kinds of offers I used to get. But it's not all about easy money. You need to know exactly what you want out of life." Vitali’s biggest problem these days is boosting the standing of his UDAR party, which is lagging in the polls ahead of Ukraine's Oct. 28 elections. What Vitali wants most now, though, is a win over Charr and another successful defense of his title. He should get that on Saturday, and it will take a lot less than the two hours the documentary takes to tell the story of his life.